Rénové, rétro, relaxant. Disposition ouverte avec des équipements modernes, baignoire extérieure. Une relique originale de Marfa ... Récemment restauré et rénové dans une charmante escapade américaine du milieu du siècle. Les détails originaux restent avec toutes les mises à jour modernes. Une toute nouvelle cuisine et salle de bain ultramoderne comprenant une baignoire sur pattes extérieure pour se baigner sous le grand ciel du Texas. prenez une bière froide et enfoncez-vous dans un bain moussant sous les étoiles. Cet artefact séculaire a été sauvé de devenir une ruine oubliée en ville, le propriétaire a été consacré à la préservation du bâtiment et à élever l'appréciation de son caractère vieilli. Il capture l'esprit que nous aimons tous au sujet du Texas et les éléments spéciaux de notre passé et les villes et les villes où nous avons grandi. Our property was perfect. Beds were comfortable and super clean. Great outdoor space and located to everything in town. It was very dog friendly with stone floors, so bring their bed. Kitchen is modern and supplied with everything you will need to eat-in/cook or store leftovers from going out. Bathroom is huge with large shower. We had one hiccup that was self inflicted but rectified by management very quickly and effortlessly. We will look for them again when we come back to this fantastic little town. Really unique place with historic charm - quite cozy and a minute drive to the center of town! This place was super unique and true to Marfa with its quirkiness. It is very clean and the mix of historic charm with modern sleek accents was visually pleasing. Even made use of the outdoor tub! I imagine during warmer months, that taking one at night looking up at the stars would be sublime (it was February, so a day time bath it was!). The host was also quick to reply with instructions on how to get in when we couldn't get the arrival packet to download when we pulled up. A couple of small things would have made the stay a 5-star experience: coffee to use in the coffee maker, wifi (the wifi was out our entire stay despite several attempts to reset the router - and cell service is spotty, so quality wifi is key if you aren't able to 100% disconnect from the world during your stay in Marfa), and a longer cord for the space heater to keep it further away from the bed (other outlets were too far from the bed to have kept us warm during the cold nights). 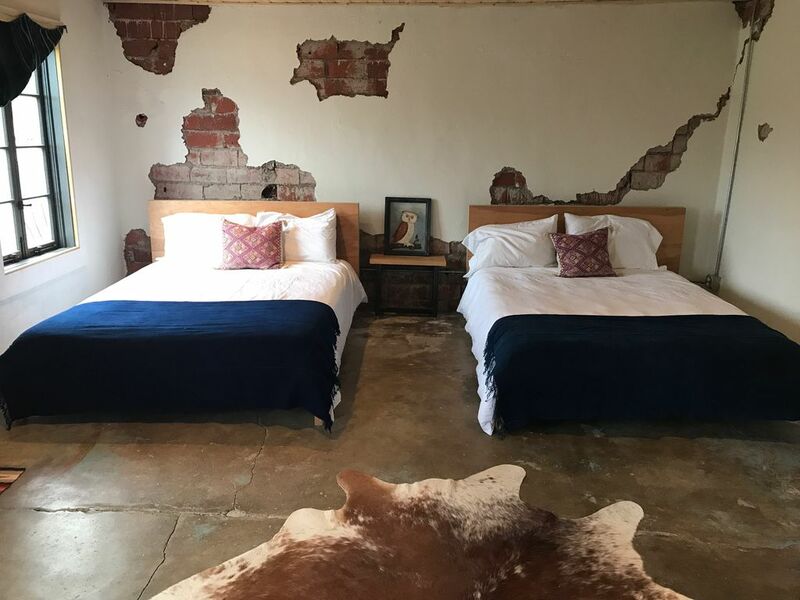 The Highland Service Station is the perfect place to call home while visiting Marfa! It's unique, beautiful, well-equipped and super cozy. Within walking distance of some great restaurants and only a quick jaunt (or still walkable trip) to the main strip. Highly recommended!